For over 10 years, here at tacotunes.com we have been developing products specifically for Toyota’s. 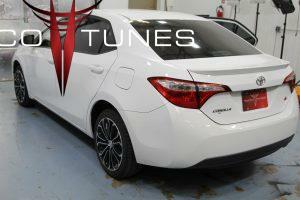 Our products provide you the best options to upgrade your Toyota Corolla Sound System. We provide turnkey audio packages or the custom parts and plug and play harnesses that make building your own system fast and easy. Below is a an audio overview on a 2014 Toyota Corolla S and the products we used to upgrade the audio. We will cover every details necessary to get your Toyota Corolla Rocking. This Toyota Corolla came equipped with six stereo system. The post is broken into two parts, before and after. The front doors were equipped with 6.5″ speakers in the lower door and tweeters built into the front door sail panel. Replacing the speakers in the Toyota Corolla is a bit of a chore. However, be sure to see our step by step videos that show you how to replace your front door speakers and tweeters. The rear deck (behind the rear seats) came equipped with speakers that resemble 6×9″ speakers. Using our heavy duty speaker adapters we installed a set of 6.75″ Kicker Component Speakers in the front doors of this Toyota Corolla. In addition, we modified the stock sail panels and installed the the tweeters in the same location. The front door tweeter and speakers are “tied” together. If you remove the stock tweeter(s) you will lose the front door speaker. We offer a plug and adapter that plugs directly into the stock wiring location for both the stock tweeter and the stock speaker. No cutting or splicing necessary. You can use component speaker or standard coaxial speakers with our harness adapters. Use our pre-packaged setup or build your own and get the harnesses and other parts you need from our shopping cart. Upgrading your speakers is a great way to improve sound, but without increasing the power you will not get much performance from your aftermarket speakers. 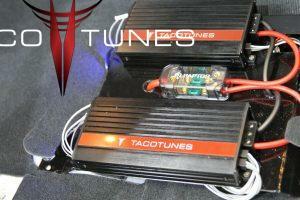 Our plug and play amplifier system will boost your stock system from 15 watts to 70 watts (RMS). Over 4x the power. Plus it is completely plug and play. You do not have to cut or splice any of your stock wiring. We provide a wire harness system and detailed installation instructions. Be sure to check out our shopping cart of a number of options for your Toyota Corolla. 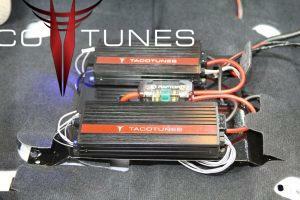 In this setup, we used our plug and play amplifiers system for your Toyota Corolla. If you are looking for deep rich bass, you will need air space. There is an old adage, “no replacement for displacement”. This could not ring more true than with a sub woofer box. After numerous requests from customers, we developed a high performance solution for your your Toyota Corolla S. At nearly 3 cubic feet and loaded with two full size 10″ subwoofers, this subwoofer provide amazing bass and sound quality. The best part is you can still use a large part of your trunk. The down fire subs create a raised floor where you can still “throw” things into your trunk without worrying about damaging your subwoofers.